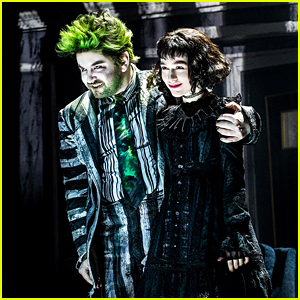 The new musical Beetlejuice, based on the beloved Tim Burton movie, is now playing on Broadway and the first official production photos have been released! Tony nominee Alex Brightman stars in the title role while newcomer Sophia Anne Caruso, who is already a two-time Lortel Award nominee, plays Lydia. Beetlejuice tells the story of Lydia Deetz, a strange and unusual teenager whose life changes when she meets a recently deceased couple and Beetlejuice, a demon with a thing for stripes. When Lydia calls on Beetlejuice to scare away anyone with a pulse, this double-crossing specter unleashes a (Nether)world of pandemonium, and the biggest sandworm Broadway has ever seen. Also starring in the new production are Kerry Butler, Rob McClure, Leslie Kritzer, and more. The official opening night is on April 25! 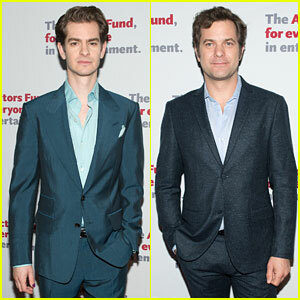 Andrew Garfield and Joshua Jackson are looking dapper at the 2018 Actors Fund Gala! The 34-year-old Hacksaw Ridge actor and the 39-year-old The Affair star stepped out for the event held at Marriott Marquis Times Square on Monday (May 14) in New York City. The gala was held to honor leaders in the performing arts and entertainment community. They were joined by Lauren Ridloff, Kenny Leon, Denise Gough, John Riddle, Jelani Alladin, Annette Bening, Warren Beatty, Uma Thurman, and Mandy Gonzalez. Jamie Parker, Clinton Kelly, Cheech Manohar, Barrett Wilbert Weed, Anthony Boyle, Kerry Butler, Mandy Patinkin, and Lorne Michaels also stepped out to show their support. Daniel Franzese – aka Damian in Mean Girls – signed “I totally went here!” on one of the bathroom stall props while visiting the cast of the new Broadway musical of the same name! The 39-year-old actor was joined by Stranger Things star Gaten Matarazzo as they stopped by the August Wilson Theatre on Tuesday (April 10) in New York City. Daniel brought along his fiance Joseph Bradley Phillips. 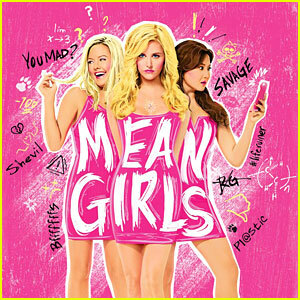 Broadway's 'Mean Girls' Is Now Open - Watch a Sneak Peek! The new Broadway musical Mean Girls, based on the beloved movie of the same name, is officially open and the reviews are in! 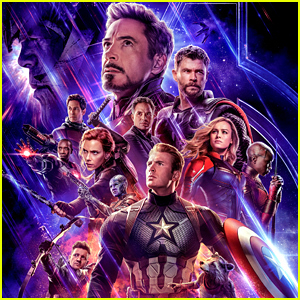 The performances by leading ladies Erika Henningsen (Cady), Taylor Louderman (Regina), Barrett Wilbert Weed (Janice), Kate Rockwell (Karen), and Ashley Park (Gretchen) are getting positive notices and Tina Fey‘s book is getting acclaim for the updated version of her story. The musical features music by Tina‘s husband Jeff Richmond and Legally Blonde the Musical‘s Nell Benjamin. Casey Nicholaw, the Tony-Award winning director of The Book of Mormon, directed the show! You can watch a sneak peek preview below and check out production photos in the gallery!